Guess what? Good news: today you are a “Future Falcon,” but soon you’ll officially be a student of Bowling Green State University! How does it feel? Unreal? Yeah, thought so. With Move-In and Opening Weekend just around the corner, here are some tips and tricks to help Move-In Day go just a little smoother! Go to bed early and get a good night’s sleep. Again, trust me, you’ll thank yourself in the morning. Chances are you’ll have some pre-move-in jitters the night before, but if you get to bed early, you’ll have more time to fall asleep. In the morning you’ll feel refreshed and ready to take on the full day ahead of you! Eat a hearty breakfast. Even if you don’t usually eat breakfast, eat breakfast. You want to be in your best mood with the most strength and energy for the day and breakfast will provide you with just that! Plus it’ll give you a nice chance to have some one-on-one time with the parental units before you flee the nest. Send your new roomie a quick text. “Hey boo, can’t wait to see you.” (added bonus points because it rhymes) Quick, easy, effortless. Covergirl. Well maybe not, but I think you can see where I’m taking this… The text lets your roommate know you’re thinking of them and can’t wait for what’s ahead! 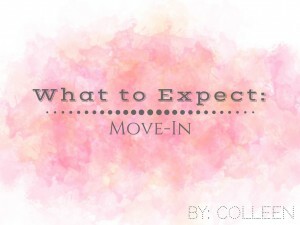 It’ll go a long way and will [hopefully] allow move-in day to be less awkward! Take pictures! Please, for just this once, don’t give your mother a hard time for wanting to capture every moment. Take a picture of that outstanding breakfast, the van full of supplies, the sign outside of your dorm, and you and your roommate after things are put away! You’ll want to look back on it in the days to come. Don’t worry about your dorm being perfect right away. Just put things somewhere. Don’t stress about everything being and looking just right. It’ll just add unneeded worry and waste precious time that you could be spending with the people you love. After all, you’ll have the rest of the year to organize things the way you like and figure out what works best for you. Be patient. Unfortunately, some things are bound to go wrong. Show your expectations to the door and just go with the flow. Also, just incase you are worried about forgetting something, your parents aren’t dropping you off in the jungles of Nigeria. Fortunately, there are plenty of stores in close proximity to campus (Meijer is probably your best bet). Utilize them if necessary! Go to lunch with your roomie and his or her family. This is an awesome way to bond with your new pal and get to know them and their family! I definitely recommend this, even if you didn’t know your roommate before move-in day. Just make sure you bring it up before move-in day so both families can plan ahead. Also bonus points for you already trying some of downtown BG’s best on your first day there! Meet people on your floor. Grab your roommate, make like a Girl Scout, and start knocking on doors. Don’t be afraid to introduce yourself and start making new friends. Who knows, your new neighbors could just really use an extra hand with all their luggage! Embrace it. Embrace your first imperfectly perfect day at BGSU. Embrace your mom and dad’s tears as they head out the door and leave you in your new home. Embrace the bittersweet endings and awkward beginnings. Embrace the toothbrush you forgot and your family’s embarrassing stories at lunch. Embrace it because these are your first real memories at Bowling Green.